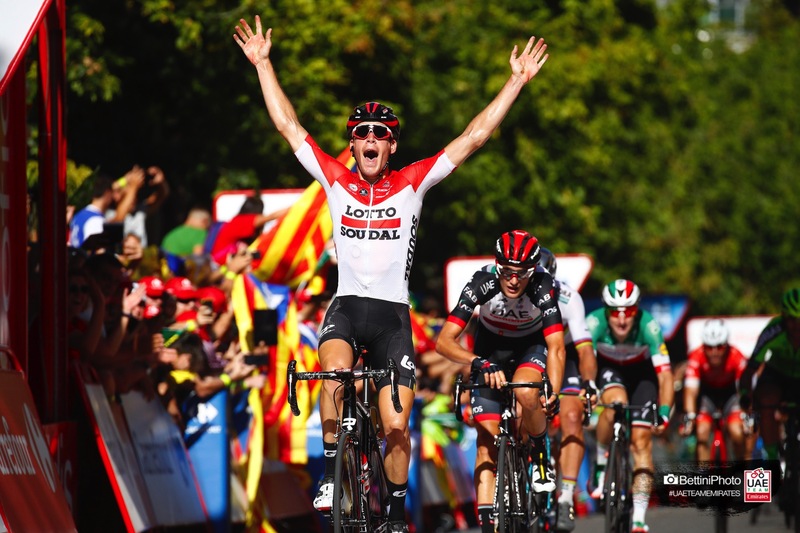 UAE Team Emirates’ Sven Erik Bystrøm narrowly missed out on a victory during Stage 18 of La Vuelta today, after being pipped at the post by Jelle Wallays (Lotto Soudal) in 3:57:03”. The Norwegian star put in a Herculean effort, forming a breakaway with two allies immediately after clearing the neutralized zone in Ejea de los Caballeros. Bystrom looked incredibly strong throughout the day as he pushed the breakaway trio for over 180kms across the pan flat course to Lleida. With 7kms to go the trio became a duo as Jetse Bol (Burgos-BH) was dropped from the group. The reduced horse power didn’t deter Bystom who continued to believe that the breakaway would have its day. As he reached the final 200m run in – with the bunch fast approaching and Wallays following his wheel – he launched his own sprint only for his breakaway companion to come over the top and take the win by a bike length. Despite a experiencing a heavy crash in yesterday’s race, UAE Team Emirates’ GC Leader Fabio Aru decided to remain in the Tour of Spain and take on stage 18, which he completed safely with the peloton, 3:06” behind the race winner. Stage 19 sees the peloton set off on a 154.4km route that gradually rises from the departure in Lleida to the foot of the Coll de la Rabassa – a point which signals the start of a 17.5km climb to yet another summit finish – this time in Andorra Naturlandia. The overall route is a rolling false flat starting 150m above sea level and rising to 940 meters, before hitting The Rabassa which boasts 2,025m of altitude and has a series of double digit ramps along the way.